Walkers heading for England’s highest peak face being quizzed on their preparedness. Members of the public setting out for Scafell Pike on Sunday will be asked what gear and clothing they have and what weather they expect. Mountain rescue callouts in the area are at an all-time high and the exercise at Wasdale Head is part of a joint effort to tackle the problem. Rescuers are teaming up with police officers and the National Trust for the fact-finding event at Brackenclose car park, one of the main starting points for the ascent of the 978m (3,209ft) peak. Those leaving the car park for a day in the hills will be asked about what they have packed to take with them, local weather conditions and how long their planned walk should take. Organisers said the intention is to learn from walkers and for walkers to have an even better day on the mountain. Richard Warren, chairman of the Lake District Search and Mountain Rescue Association and member of Wasdale Mountain Rescue Team said that many of the 140 callouts received by the Wasdale team last year were for Scafell Pike. Already this year they have responded to 34 callouts including three fatalities and a serious injury on Friday 18 May. The last involved 11 team members, three rescue vehicles, an air ambulance and a Coastguard helicopter. Mr Warren anticipates the team’s 38 volunteers to be called out at least three to four times a week during the peak summer holiday period. He says this is potentially unstainable for a purely volunteer organisation. 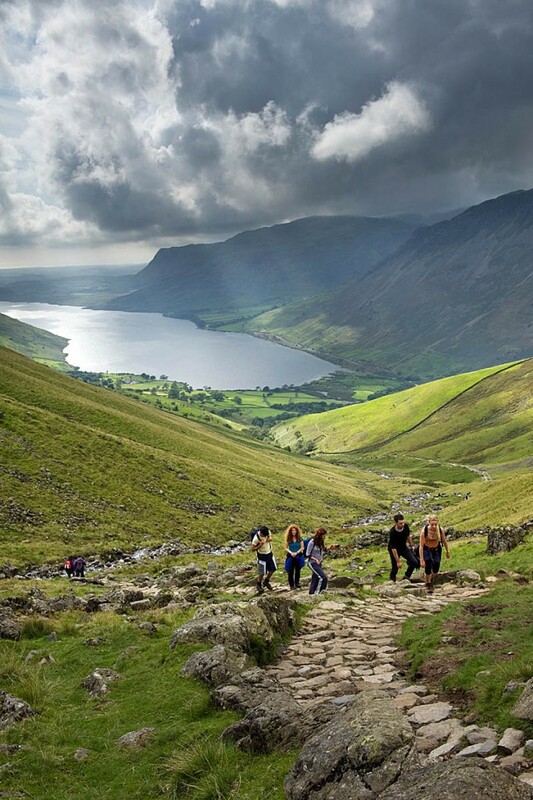 Event organiser Marian Silvester, the National Trust’s general manager in the west Lakes said: “Our welcome staff, rangers and campsite team regularly talk to the thousands of visitors who climb Scafell Pike from Wasdale every year. Superintendent Matt Kennerley of Cumbria Constabulary said: “Walking Scafell Pike can be dangerous if you are ill-prepared for what may lie ahead. The priority of us all is to make sure that everyone who sets off on such an endeavour is able to return home safely at the end. The county’s police and crime commissioner Peter McCall will also attend for part of the exercise. He said: “ It will be helpful for us all to understand a bit more about the range of experience and knowledge of the walkers who will be setting off to climb Scafell Pike – not least to get people thinking about the level of challenge they are about to face and how prepared they are for it. This is a fantastic idea, well done everyone involved. I hope people will take it in the spirit in which it’s intended and Head up scafell Pike safer and we’ll-prepared, either cause they already were, or due to a little help. Great effort but doubt it will make any difference. We went up there when it was in full winter condition earlier this year and we were quizzed on what gear we had. When we opened the boot and the guy saw the multiple ice axes, crampons, and B3 boots he burst out laughing and said "I think you'll be OK". Then a car pulled up with a group of guys in, they got out and most of them had trainers on, no winter gear at all. The guy quizzed them and they were clearly unprepared, but they laughed and went up anyway. We passed them on the way down struggling to get over the snow and ice at Brown Tongue. The main issue is that people have driven a long way with the intention of climbing the Pike; given the effort they've already put in, very few people will be discouraged at the car park. I really hope it makes a difference but I suspect it won't. I know the intentions are good but personally if I knew my preparations for a day on the mountains were going to be checked it would stop me from visiting. So what happens if the questioners find some people who they think are under-equipped? Useful as a conversation with walkers. No one will turn you around, but it might give many something to reflect on. Or even stop a call-out? Great idea as it might also raise less experienced walkers' awareness of the potential consequences of unpredictable conditions. Do the questions include prior experience of walking in changing conditions; eg, awareness of how quickly clear skies can deteriorate to impenetrable mist? Do the questions include basic navigation skills of map and compass? Hope the results are published as they will no doubt make interesting reading. A positive initiative in my view. If it prevents just one avoidable call-out or a fatality then it's worth the effort. Hats off to all those involved and as others have said, it'll be interesting to see how it has worked out. Maybe worth considering for Helvellyn, now Britain's favourite walk apparently? I don't suppose the questioning will have made many, if any, of those not properly prepared change their plans, we can only hope it gave them food for thought and perhaps, just perhaps, they will act next time. I was on Scafell Pike with a pal on Sunday (we walked the quiet way from Jubilee Bridge, up via Pen and returning via Lord's Rake, West Wall Traverse, Deep Gill, Scafell and Slight Side). It was heaving on Scafell Pike and Scafell was the busiest I've ever seen it. Many of those on The Pike were clearly not properly kitted out - trainers, shorts, football shirts for the lads and skimpy tops for the lasses seemed to be the order of the day, many without backpacks. We felt terribly over-dressed and out of place with our 25l rucksacks! We did Snowdon the last Bank Holiday in great weather and like you Rod had 25l packs with water bladders and wearing leather boots. We were definitely the most overdressed there. Didn’t actually see anyone in flip flops but everything else on view. And why do some people have music blaring out? !